There are MANY versions of this recipe floating around the web, but a lot of them had ingredients that I didn’t have, and took time for prep that I didn’t have…so this is a VERY simplified version. This chicken is a hit with adults and kids – we have never had leftovers when I make it! 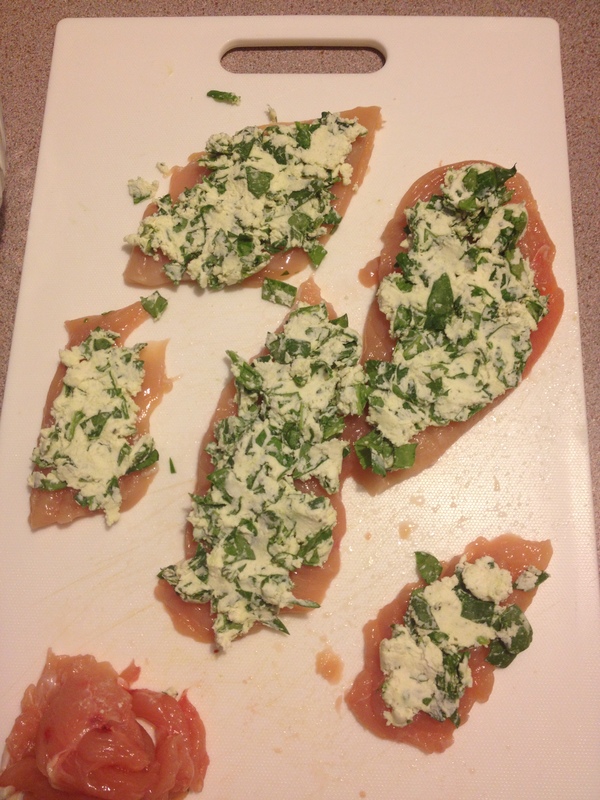 Ok, let’s get started – Other than boneless, skinless, chicken breasts, all you need is baby spinach and Boursin. That’s right – three ingredients. Easy peasy. Ok, you’ll need toothpicks too, but everyone has those lying around, right? Fancy recipes will tell you to pound down those chicken breasts until they are fairly thin and even. I was trying to do this with a three-year old at my feet and a baby in the Tula, so time was of the essence. I cut the chicken breasts in half so they were half the thickness (quicker cooking time! ), and pounded it out a but to flatten it. Now, because I’m a pretty fancy cook (laugh, snort), I don’t have a proper meat tenderizer…so I just used a potato masher wrapper in saran wrap. I know, pretty ghetto, but it did the job! Onto the filling! 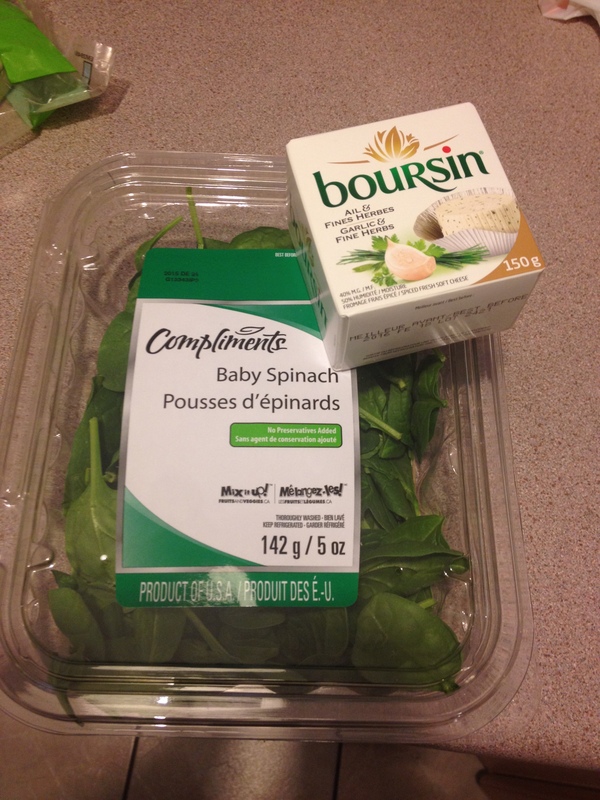 Chop up about 1.5-2 cups of the spinach fairly fine, and mix in the package of Boursin cheese. Spread it generously over the flattened chicken breasts, as seen below. 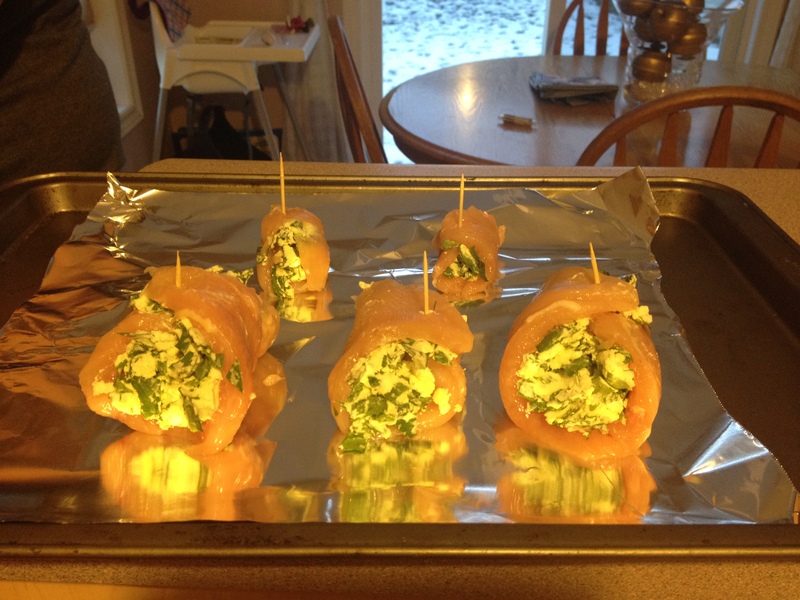 Now, just roll the chicken and stuffing up and pop a toothpick in to hold it in place. Pop into the oven at 375 degrees for about 35-45 minutes (all depends how much time you invested in the pounding stage!) or until the juices run clear. Here is a not-so-great picture of the finished product. When I have time, I sometimes broil it for a few minutes to get it browned on the top, but I was in a bit of a rush to get it on the table. Enjoy! 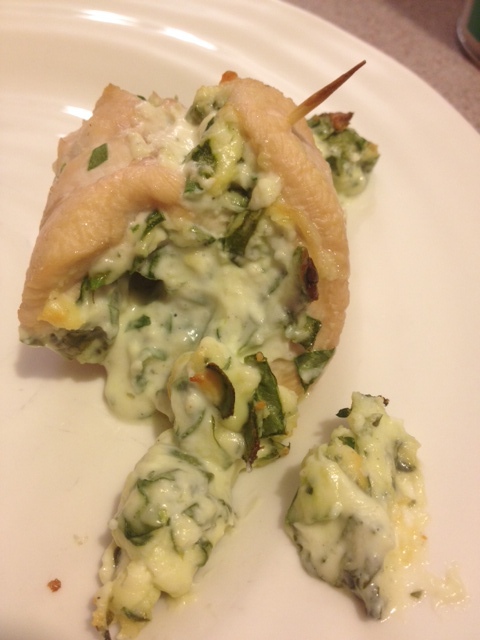 This entry was posted in Food and tagged boursin, chicken, dinner, spinach, tasty tuesday.